This is the 7th and final installment of the memoir of Bryan G. Sherman, written in 1974-5 when he was 82 years old. Previous installments can be found down page and by following the March and April 2018 archives links found on the Museum Home page and elsewhere on this website. I can remember back when you could buy a Sunday newspaper for a nickel. Now (1975) our Cedar Rapids paper delivered to the door is 95 cents per week. The Sunday Des Moines Register paper was bigger in those days. Another thing I remember was making homemade ice cream. A custard was made with eggs, milk, and sugar, with flour or something else for thickening. This was cooked and then thinned with whole milk and cream with a favorite flavoring. This was put in a hand-crank ice cream maker consisting of a can with paddles inside that turned when the crank on the wooden tub or freezer was turned. This can was filled nearly full and a cover was clamped on. Then the work started. A mixture of chipped ice and salt was packed around the can inside the wooden tub to freeze the ice cream mixture. When the crank was turned the can went in one direction and the paddles just opposite so as to stir the mixture inside. We kids always liked to be there when the freezing was done and the paddles removed from the freezer. We always got to lick the ice cream off the paddles. Very few folks make ice cream anymore as commercial ice cream is so plentiful and can be bought at any store, but for some reason it just doesn’t taste like the old homemade kind. We always had a good supply of ice as we always filled the icehouse every winter with cakes of ice packed in sawdust. No one anymore packs ice as there are commercial ice machines run by electricity which furnish what little ice is used nowadays. The old wooden ice box that was used is gone as the electric refrigerator has taken it’s place. The local food locker has boxes to rent at their plant so that one can store all kinds of meat, fruits, and vegetables. The locker plant also does most of the butchering anymore and cuts up, packages, and freezes the meat for storage. Some people have a home freezer which will hold quite a lot of food and all refrigerators have a freezer compartment to store frozen food in for almost any length of time, and can also make ice cubes as needed. We had no telephone in the early days and it might be several days before we would hear any news. We finally got a telephone and about the same time got rural delivery of the mail right to a box out by the side of the road in front of the house. When mail delivery came to us, we got our mail every weekday. At times the mail carrier drove a team of horses hitched to a buggy, or often a sleigh in winter. Some carriers had a boxed in affair built on a running gears so he could ride inside, out of the weather. This had a glass front with a slot to run the reins through with which to drive the horses. Before rural delivery we got our mail whenever we went to the post office after it, and during my high school years I used to bring it home unless Dad had picked it up in the morning when he was on the milk route. Now with air service a letter will go or come from Germany in 3 or 4 days. At Christmas time we had a package from Germany which had been sent by our grandson and wife which took only 4 days for it to arrive. News, which years ago took days, weeks or even months to travel around the world, now reaches the same distance within minutes from the time it happens. This news is relayed by satellite through television or radio. Pictures are even transported the same way and when our astronauts were on the moon we could even see them moving around. We get our weather reports now by television long before they happen, so one now can prepare for bad weather ahead of time. Of course the process sometimes makes mistakes but in most cases can be depended on. Years before, a lot of this was mere guess work. Our language has even changed with the addition of many new words. I am not elaborating on these as I am not too familiar with them. I can remember when we had six trains a day through this town of Edgewood: four passenger and two freight. One could get on the train here and make connections for most any part of the United States. When Dad and Mother attended the World’s Fair in San Francisco (1915), they got on the excursion car here and rode the same car all the way. 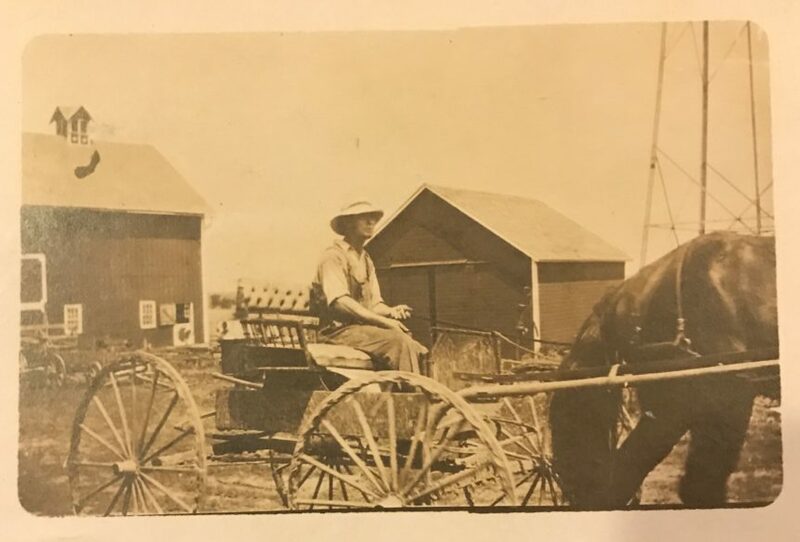 It was slower traveling those days. Now a person can get on airplanes and in a matter of hours be most anywhere in the world. To get this plane one has to go to one of the bigger cities where there is a large airfield. Anymore if one wants to travel by rail they have to drive half way across the country to find a train. I have never been on an airplane and at my age I don’t expect to do much more traveling anyway. I would have liked to take just one ride on a plane, but I don’t much care. I have been across the Atlantic Ocean both ways by boat and have seen the Pacific Ocean and rode on a ferry in it. I have visited Canada, and been in Mexico a couple of times, have seen a good part of the United States, and spent about nine months over in France in World War I, so I have no kick coming. I have lived through the time of five wars. The Spanish-American, W.W.I, W.W.II, Korean, and Vietnam. Also during my time there have been two presidents assassinated and also one almost impeachment. I have lived through several months of the so-called Watergate affair. The assassination of Kennedy I witnessed by TV and almost saw him shot. We heard about it almost the second it happened. We are now nearing the last days of January and have had a very cold and windy month. The temperature has been at zero degrees or below nearly every day of the month. Since Thanksgiving day in November 1976 we have had very few warm days and even the last 3 or 4 days of November it was down to 10 degrees and 12 degrees below zero which is very unusual for that time of year. We are in hopes of getting some moisture before spring as our snow here in this section of Iowa isn’t very much. Our soil is very dry and in much need of moisture. Someday I expect to take a final trip from which I won’t have a return ticket. I hope to be where I can join other members of my family in the great beyond. I also hope there won’t be any smell of brimstone in my final home. I have lived or tried to live a good life. Of course there have been both good and bad events. For the good I am happy and for the bad I am very sorry they ever happened. I read in a book one time a quotation, “To the living life; let the dead past bury it’s dead”. So as I close this let us forget all the bad things in life and remember only the good things, then everyone will be happy. When I am gone and laid away I hope someone (a member of the family preferred) will take it on themselves to write the final chapter. Until then dear family and friends. Bryan George Sherman died on September 8, 1984 at age 92. 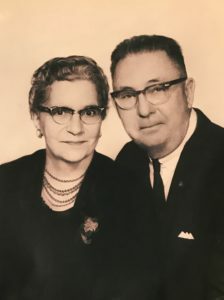 He was survived by his wife, Grace Blanche (Welterlen) Sherman (1896-1989), his daughter, Marilyn Annette (Sherman) Clark (1922-2005), his son, Kenneth K. (1925-2000), his 8 grandchildren, and many nieces and nephews.